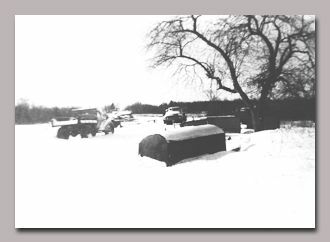 To the left is a photo of Leon and Tom Gordon and their first sod harvesting machine, taken in 1957.
hydrograsscorp.com’s roots are deeply entrenched in the erosion control / landscape industry. The company began as the offspring of Gordon Construction Corp. and a growing public awareness and concern over erosion, the siltation of our waterways and protection of our environment. In 1947 Leon E. Gordon founded Gordon Construction Corp. as a rip-rap installation contractor also specializing in guard rail construction, curbing and sodding. An early company photo shows the forward looking Leon overseeing one of the first mechanical sod harvesting operations in Maine. He is joined in the photo by an MDOT engineer and Leon’s young son Tom, currently the owner of hydrograsscorp.com . 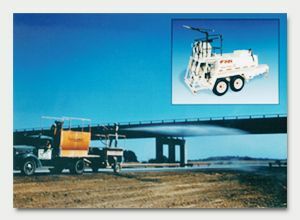 In the mid 1950′s on the advice of MDOT engineer Gordon Hunter, Leon built the first hydraulic seeder to be used in Maine for the anticipated construction of Interstate 95. According to Tom Gordon, the machine was powered by five gasoline motors and one of the problems was not knowing which of the motors had run out of gas. Soon after that Leon purchased his first FINN Hydroseeder. 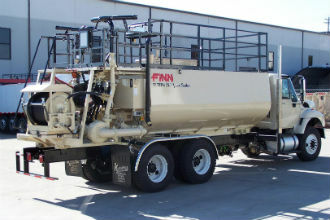 Today as an award winning distributor of FINN Equipment, hydrograsscorp.com offers both new and like new pre-owned equipment, rental units and an array of thoroughly tested and proven consumable products including fiber mulches, fertilizer, grass seed mixtures, Finn consumable products and erosion control blankets. hydrograsscorp.com also offers authorized Finn Equipment service and winter storage at their locations in Maine and New Hampshire and have multiple mobile units for road support as well as a fully stocked parts department. The Hydrograss team is committed to providing the best products and service in the green industry. This tank represents the beginning of hydraulic seeding in Maine. hydrograsscorp.com was founded in response to the need for a knowledgeable company to supply equipment, service and materials to the erosion control, construction and landscape industry. Our three office/warehouse locations; Pittsfield, ME, Nottingham, NH and Albany, NY are staffed with associates with a combined total of nearly 200 years experience in hydroseeding, bark blowing, landscaping and erosion control. We are always happy to provide sound advice on equipment and materials currently available. Our research continues keeping our commitment to developing and offering the best products to our industry. 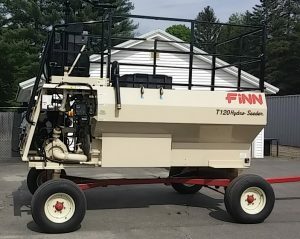 The newest addition to the Finn Hydroseeder line, The Finn Titan. Although the equipment and products have changed over the years our goal remains the same as it was nearly 70 years ago; the complete and total satisfaction of every customer we serve.